Laminated bookmark, especially for Dads, & matching pen feature Bible verse Psalm 18:2, The LORD is my rock, and my fortress, and my deliverer; my God, my strength, in whom I will trust. The back of the bookmark offers encouragement and hope to men as they see Jesus shape them to be more like Himself - built to serve! Packaged in a clear acrylic box with a silver stretch bow, Wrapped and Ready to give! Use as Christian gifts to men for Father's Day, thank you gifts for church committee members, appreciation gifts for Men's Club, pastors, and more. Product Specifications: Bookmark is 1-1/2" x 5-7/8". Pen measures 5-1/2" in length. 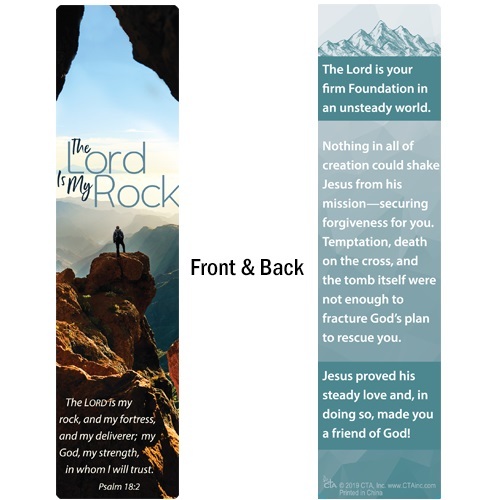 The Lord is My Rock Bookmark and Pen Set by CTA was published by CTA in March 2019 and is our 299th best seller. The ISBN for The Lord is My Rock Bookmark and Pen Set is TDLMR19ST. 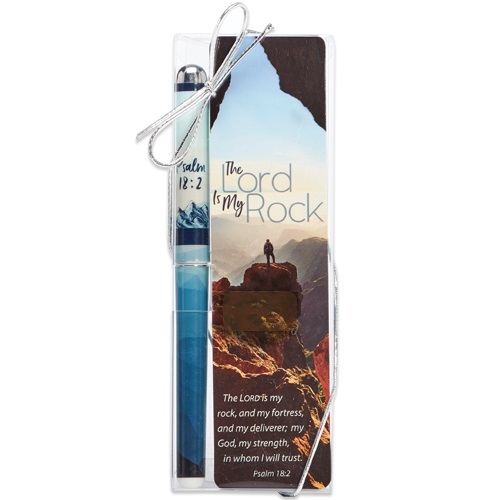 Be the first to review The Lord is My Rock Bookmark and Pen Set! Got a question? No problem! Just click here to ask us about The Lord is My Rock Bookmark and Pen Set.